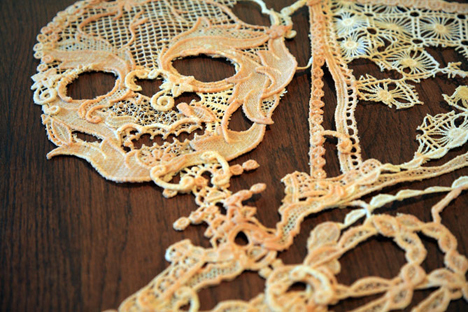 Ange 3, 2008, Lace and latex. Fette’s gallery presents “Insekts“, the first solo exhibition in Los Angeles by Swiss artist Sandrine Pelletier. The installation will consist of a new series of delicate and suggestive embroideries and other extravagant sculptures exploring the artist’s recurrent interest in childhood, its artifacts, and the memories and fables associated with this singular period.